Chris Whittaker’s philosophy is simple: respect our land and water. Use local suppliers: small farms and wild food. Nose-to-tail cooking. On premises baking and preserving. Use all resources wisely and – in the end – waste nothing. 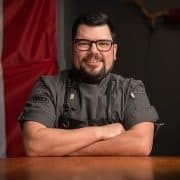 From being the driving force behind the uber-sustainable Forage and his newly opened (November 2015) Timber – to his unpretentious, adventurous food, Whittaker is one of Vancouver’s most interesting and passionate chefs and a proud member of the prestigious Chefs’ Table Society. Whittaker is an active partner and supporter of the Environmental Farm Plan, Ocean Wise, Eat Wild, Farm Folk/City Folk and numerous other tireless organizations all equally committed to promoting the sustainability of our food systems. This focus on local is integral to the Metro Vancouver food economy, from farmers to consumers, and everything in between. The path to sustainability has been an easy one for Whittaker as conservation and the use of local products is how he lives. Bee-keeping at home, preserving fruit and vegetables to have a “canless” kitchen for Forage, Timber and their catering arm, Forage Catering, and working with small lot farmers throughout the year proves Chris takes this philosophy very seriously. He is a sought after speaker within the hospitality and food service industry as well as being a keynote speaker at events such as Metro Vancouver’s Food System Policy conference. Whittaker is also a passionate hunter and fisher. Forage and Chef Chris Whittaker have been recognized for their outstanding efforts by both Vancouver Magazine Green Award and Where Magazine Green Table Network Award. Most recently Whittaker was inducted in the BC Restaurant & Food Service Association Hall of Fame. In 2016, Chef Whittaker was named one of western Canada’s Foodies of the Year by Western Living Magazine.